I was home for just a weekend, but no trip home is complete without a walk on the beach, which thankfully happens to be just a hop, skip and jump away from my house. 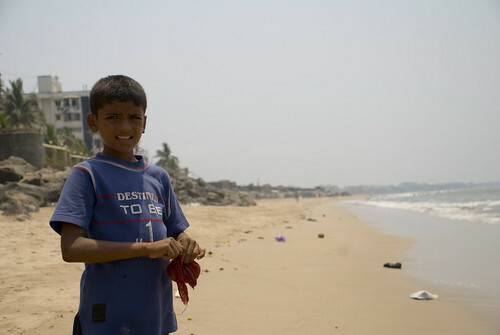 The first thing to catch my attention was this fellow, whose name was Nilesh and he happily agreed to be photographed. The message on his t-shirt stopped me short. He lives in the slums seen in the distance, and in his hands is a piece of cloth – he was collecting those he could find so that his parents could sell them off later and make some money. Seeing him, a lot of kids came around asking to be photographed. At many places in the world, photographers need to know their rights because people consider photography an invasion of privacy, but in India it’s more like photographers’ duties. 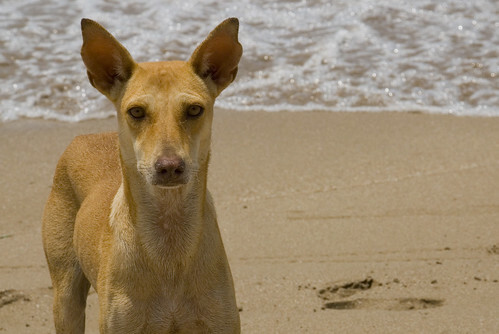 Mumbai dogs are pretty smart.. evolution and all you know. Need skills to survive in the city.. so they seemed not only perfectly aware that I had a camera but were really interested in having their picture taken. This one actually came right upto me and had his shot taken inches from his face. Maybe he thought I’d get him into Bollywood. 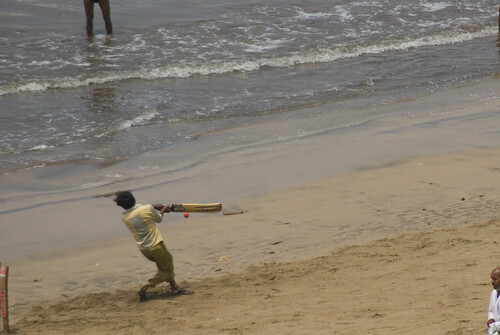 And of course, there’s always beach cricket virtually anywhere in India. The way this fellow missed a pull shot though, it’s almost like he was playing for the India team. Small things, but it all adds up to an undeniable fact – there is no place like home. 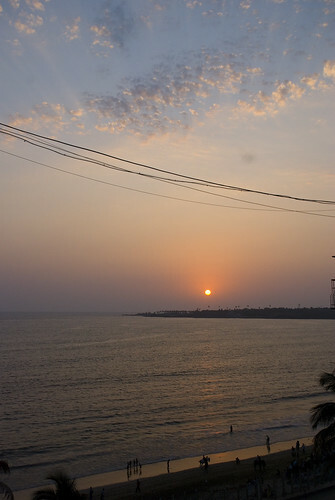 When I came back home, I saw the sunset from my window – I’ve seen a thousand times, yet it’s always different. This was written by Anshul. Posted on Monday, April 16, 2007, at 1:49 am. 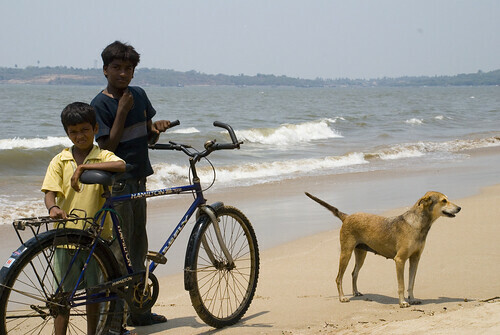 Filed under india, photos. Bookmark the permalink. Follow comments here with the RSS feed. Post a comment or leave a trackback.